Produktinformationen "Thermographic Skin Measurement and Osteopathic Palpation"
The purpose of this study was to assess thermography as a viable assessment tool to identify intraosseous strains (IOS) in the tibial bone, and to establish a correlation between thermography and osteopathic palpation. 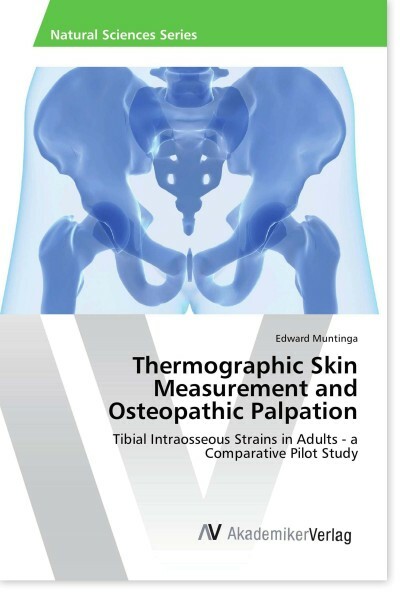 This quantitative, single-blinded observational study wanted to ascertain if it is possible to detect IOS of the tibial bone in adults by comparing thermal patterns of the overlying skin of the anterior tibia. Furthermore, it wanted to show statistically significant relations between specific osteopathic manual palpation parameters, age of the IOS and thermal information. This study used a sample size of N=86 (20 affected tibias in the case group (leg A), 20 unaffected tibias in the case group (leg B), and 46 tibias in the control group (C&D)) which gave statistically significant data through cross-tables and other statistical calculations. Strict inclusion and exclusion parameters in both sample groups (case and control group) were defined to ensure valid thermal image material.